Is it practical to test-drive autonomous vehicles to demonstrate their safety prior to releasing them on the roads for consumer use? How many miles would autonomous vehicles have to be driven without failure to demonstrate that their failure rate is below some benchmark? How many miles would autonomous vehicles have to be driven to demonstrate their failure rate to a particular degree of precision? How many miles would autonomous vehicles have to be driven to demonstrate that their failure rate is statistically significantly lower than the human driver failure rate? How safe are autonomous vehicles? The answer is crucial for developing sound policies to govern their deployment. One proposal to assess safety is to test-drive autonomous vehicles in real traffic, observe their performance, and make statistical comparisons to human driver performance. This approach is logical, but is it practical? 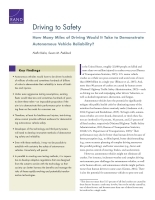 In this report, we calculate the number of miles that would need to be driven to provide clear statistical evidence of autonomous vehicle safety. Given that current traffic fatalities and injuries are rare events compared with vehicle miles traveled, we show that fully autonomous vehicles would have to be driven hundreds of millions of miles and sometimes hundreds of billions of miles to demonstrate their safety in terms of fatalities and injuries. Under even aggressive testing assumptions, existing fleets would take tens and sometimes hundreds of years to drive these miles — an impossible proposition if the aim is to demonstrate performance prior to releasing them for consumer use. Our findings demonstrate that developers of this technology and third-party testers cannot simply drive their way to safety. Instead, they will need to develop innovative methods of demonstrating safety and reliability. And yet, it may still not be possible to establish with certainty the safety of autonomous vehicles. Therefore, it is imperative that autonomous vehicle regulations are adaptive — designed from the outset to evolve with the technology so that society can better harness the benefits and manage the risks of these rapidly evolving and potentially transformative technologies. 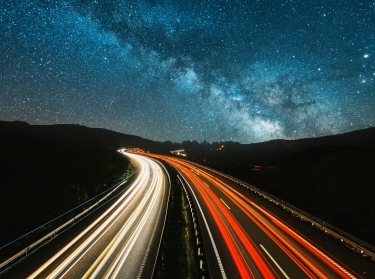 Autonomous vehicles would have to be driven hundreds of millions of miles and sometimes hundreds of billions of miles to demonstrate their reliability in terms of fatalities and injuries. Under even aggressive testing assumptions, existing fleets would take tens and sometimes hundreds of years to drive these miles — an impossible proposition if the aim is to demonstrate their performance prior to releasing them on the roads for consumer use. Therefore, at least for fatalities and injuries, test-driving alone cannot provide sufficient evidence for demonstrating autonomous vehicle safety. Developers of this technology and third-party testers will need to develop innovative methods of demonstrating safety and reliability. Even with these methods, it may not be possible to establish with certainty the safety of autonomous vehicles. Uncertainty will remain. In parallel to developing new testing methods, it is imperative to develop adaptive regulations that are designed from the outset to evolve with the technology so that society can better harness the benefits and manage the risks of these rapidly evolving and potentially transformative technologies. This research was conducted in the Science, Technology and Policy Program, a part of RAND Justice, Infrastructure, and Environment. Kalra, Nidhi and Susan M. Paddock, Driving to Safety: How Many Miles of Driving Would It Take to Demonstrate Autonomous Vehicle Reliability?. Santa Monica, CA: RAND Corporation, 2016. https://www.rand.org/pubs/research_reports/RR1478.html.